For an area of the United States most famous for being the name of a fried chicken fast food restaurant, the state of Kentucky could do with a helping hand in improving its image in Britain. Fortunately for the place (but mostly us) it can kick out a decent band or three. Nurtured by some fellow southern hard rockers, 4Forty9 are one such band. Produced in part by Jon Lawhon and Chris Robertson from Black Stone Cherry, their band's influence on their protégés here is unmistakeable: big choruses, crunching guitars and pounding rhythms. Heralded by some ivory tinkling, the throwaway piano gives way to crunching guitar work and their debut album 'The Best Part Of Me', and its title track, gets off to a real kicker. Technically rough around the edges, this adds to their charm. Trevor Smith's gravelly tones will only improve with age and could by no stretch of the imagination be a real powerhouse as shown in the lively 'Fire', built around his chesty tones. He could do worse than pay attention to Robertson's emotive growls. The dual guitar kick by Malcolm Booher and Jordan Henson is more than capable of whipping up some tight, crunching riffs to really nod your head to; the down 'n' dirty 'Man O War' will see to that. The barrelling gusto of bassist Dakota Henson and drummer Justin Bush help to further damage neck fibres with the likes of Buckcherry/Bon Jovi arena-sized 'Love Like A Suicide' and savage 'The Moth'. 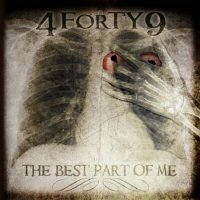 4Forty9 could be equally at home on stage with the likes of brothers-from-other-mothers BSC through to Black Country Communion (RIP) – and this hard-edged but radio friendly territory is where 449 comfortably sit. However, 'TBPOM' is no masterpiece. Some of the songs are sloppy and a few tricks (vocals through a megaphone) sound gimmicky. But it does have plenty of solid, hard rock – and that's the best part.